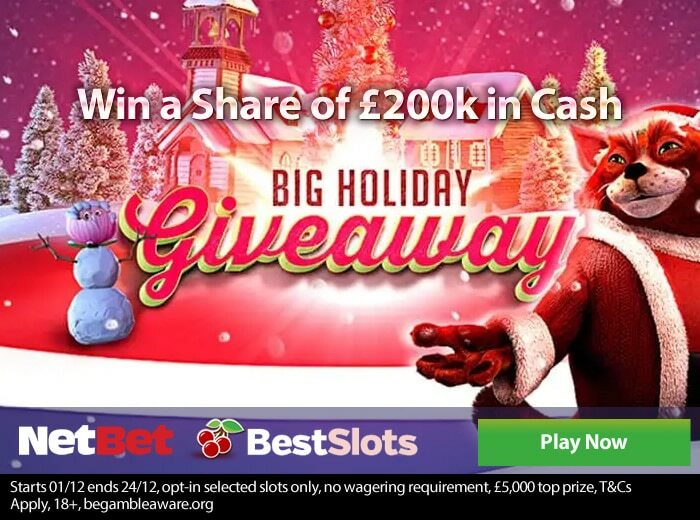 NetBet Casino is getting into the Christmas spirit with its Big Holiday Giveaway which will award players £200,000 in a trio of special prize draws. To be in with a chance of winning, first click on the Take Part tab then get playing on 1 of the following Net Entertainment slot games: Fruit Shop Christmas Edition, Secrets of Christmas, Flowers Christmas Edition, Jingle Spin, The Legend of Shangri La: Cluster Pays and Berryburst. Wager £20 on these specially selected slot games on a single day and you will get a you ticket into a prize draw where the big money can be won. You can earn up to 5 tickets on any given day. There are 3 draws in total. All the prizes throughout the competition are in cash and don’t come with any wagering requirements. The Big Holiday Giveaway is open to new and existing players at NetBet Casino. New players can take advantage of an exclusive offer whereby you’ll get up to £200 in bonuses as well as up to 200 free spins to use on any Net Entertainment slot game. Sign up and deposit using the code EXCLUSIVE1 to get a 100% bonus up to £200 plus 25 free spins. On your second deposit, use the code EXCLUSIVE2 to get 75 more free spins. On your third deposit, you’ll get 100 free spins when using the code EXCLUSIVE3. You can use the free spins on any Net Entertainment title including Vikings or any of the Christmas themed slot games mentioned above. Finally, only debit or credit card deposits are eligible for this promotion.